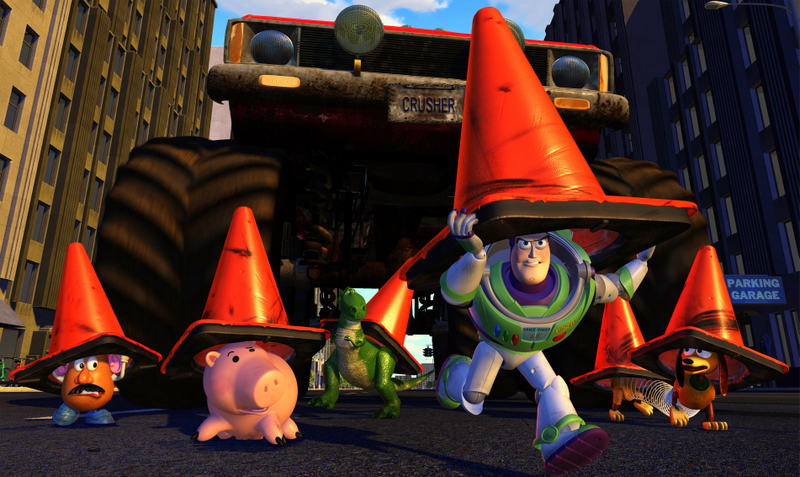 John Lasseter’s “Toy Story.” Courtesy of Pixar. Perhaps only John Lasseter could’ve transformed an ordinary table lamp into the next Mickey Mouse. In his Oscar-nominated 1986 short, “Luxo Jr.”, Lasseter ingeniously brought a lamp to life by allowing it to move and behave like a human being, while still maintaining its distinctively mechanical identity. This lamp would be destined to become the logo for Pixar Animation Studios, a fitting choice, considering how it encapsulates the essence of the studio’s appeal. Pixar’s trademark approach to storytelling has been to graft human characteristics onto nonhuman entities—something Disney has done for decades—while notching up the realism tenfold, resulting in fascinating hybrids that simultaneously resonate on a human and inhuman level. These characters are often caregivers who serve their human “masters” (toys eager to please their owners; monsters learning to befriend children; robots cleaning up mankind’s mess; emotions keeping a girl balanced). A mismatched comic duo (Woody & Buzz; Mike & Sulley; Marlin & Dory; Joy & Sadness) will often break out of their enclosed environment (a bedroom; an ant colony; a human mind), while leaving the colorful ensemble to occupy a parallel narrative (in a fish tank, control room, etc.). The heroes will be brought to a low point (at a garbage dump, in the Arctic, inside a whale) in order to be brought back up again, while transforming their world with new ideas and a matured philosophy. What’s amazing is how the studio has managed to revitalize this formula repeatedly for much of the last two decades, while raising the bar for family entertainment in American cinema. 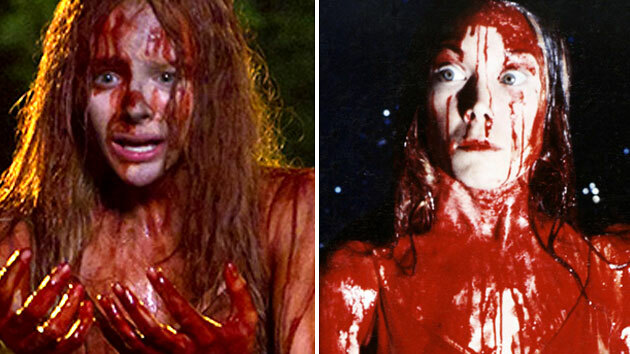 They have continuously made the old feel new again and have spent a large portion of their budgets on seemingly throwaway details (the texture of blue fur or the density of water or the amorphous “skin” of an emotion) that make their films’ visual landscapes far richer than those of their competitors. With the studio’s latest feature, “The Good Dinosaur,” scheduled to premiere on November 25th, three days after the 20th anniversary of Pixar’s very first theatrical release, Indie Outlook is ranking the Top Ten Pixar Movies to celebrate the company’s unprecedented streak of brilliance. 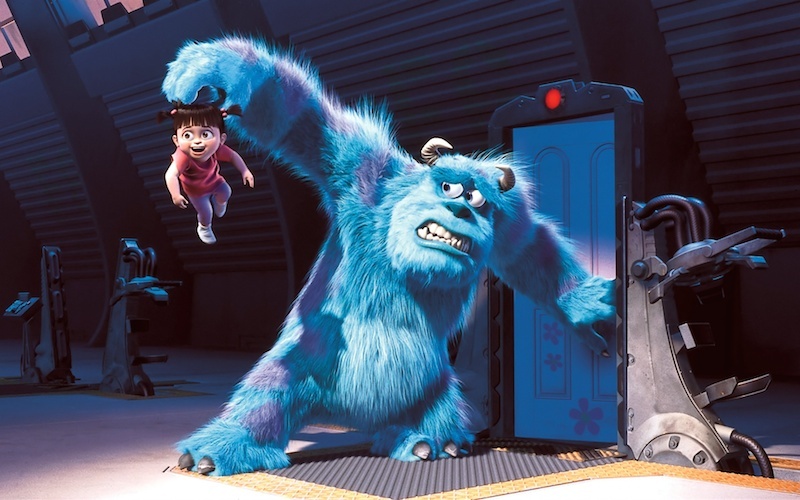 Pete Docter’s “Monsters, Inc.” Courtesy of Pixar. A pleasingly minor work in the key of “101 Dalmatians,” which is evoked in the jazzy opening credits, Pete Docter’s cheerful lark nevertheless makes the cut largely due to the surprising depth of its warmth. Pint-sized cyclops Mike (Billy Crystal) and fearsome scare-master Sully (John Goodman) are among the monsters tasked with sneaking through children’s closets and garnering their screams, which serve as the power source in their creature-filled parallel dimension. The monsters’ headquarters appears to have been heavily inspired by “Men In Black,” complete with scare simulators where employees can test their frightening tactics. There’s a timely message here about the vitality of seeking alternate energy solutions less harmful to the planet, and the contamination-fighting crews foreshadow those later seen in “WALL-E.” Goodman’s cuddly voice-over performance is utterly irresistible, especially when he befriends a precocious girl, nicknamed “Boo,” who babbles and behaves exactly like a toddler her age. Crystal has some memorable wisecracks, such as when he tells suspicious onlookers that the argument he’s having with Goodman (over taking “Boo” back home) is in fact a rehearsal for a song-and-dance routine entitled, “Put That Thing Back Where It Came From Or So Help Me.” The thrilling roller coaster finale ups the ante on the conveyor belt-set climax in “Toy Story 2,” and the very last shot (holding on Sully’s face) is a tear-jerking beaut. Beneath it all is an unmistakable truth that many of the “monsters” we’re scared of, especially as kids, are often far more frightened of us. Just ask the spider on your wall. John Lasseter’s “A Bug’s Life.” Courtesy of Pixar. Sandwiched between the first two “Toy Story” flicks, Lasseter’s “A Bug’s Life” has become somewhat lost in the shuffle over the years, thus making it easy to forget how it upstaged DreamWorks’s strikingly similar CGI toon, “Antz,” which was released the same year. This kicked off a string of Pixar releases that rendered DreamWorks wildly inferior by contrast (who needs “Shark Tale” when you have “Finding Nemo”?). “Antz” may have gotten criticized for being “too adult” for family audiences (Woody Allen was the lead, after all), but “A Bug’s Life” also has its share of edge, such as a truly nasty villain in the form of a tyrannical grasshopper (Kevin Spacey) hellbent on enslaving a colony of ants through systematic oppression (he’s scary all the way up until the blooper reel). “Ideas are dangerous things,” he declares, causing the submissive insects to reject the forward-thinking inventions conjured by our hero ant, Flik (Dave Foley). After the neurotic princess Anna (Julia Louis-Dreyfus, channeling Selina Meyer) orders Flik to leave the kingdom on a presumably impossible aid mission, he returns with an eccentric team of traveling circus bugs—including a very manly ladybug (Denis Leary) and a scene-stealing caterpillar (the late Joe Ranft)—that he’s mistaken for warriors. Among the talent-packed cast is comic genius Madeline Kahn in one of her final film roles. She demonstrates her ageless deadpan flair in her introductory scene, as her character (a luminous moth) sings to her reflection in a mirror (a la “Young Frankenstein”), while informing her bumbling husband, a fellow theatre vet, that the stage is in the other direction. 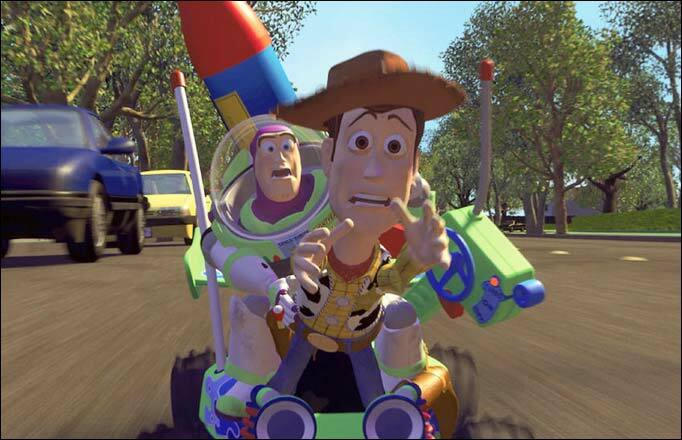 John Lasseter’s “Toy Story 2.” Courtesy of Pixar. 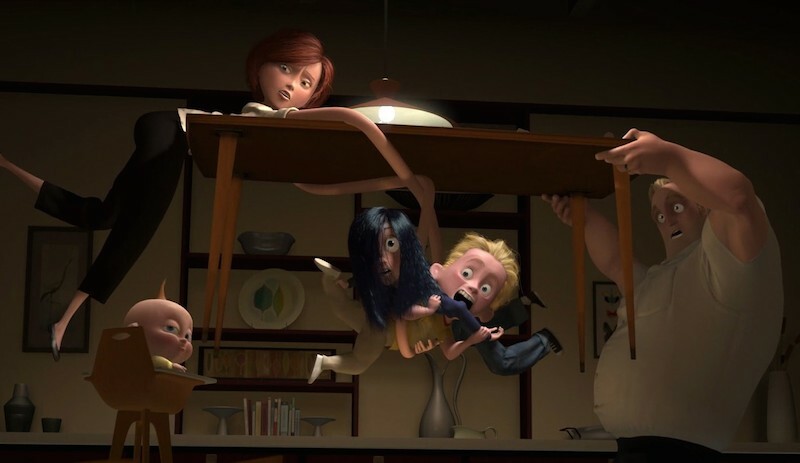 Brad Bird’s “The Incredibles.” Courtesy of Pixar. Five years after helming the modern animated classic, “The Iron Giant” (heading back to theaters September 30th), Brad Bird brought a new level of sophistication to Pixar with this exceptionally nuanced action picture about a family endowed with super powers. Predating the Marvel craze, not to mention a glut of DIY superheroes, and even featuring a pre-“Avengers” Samuel L. Jackson (who gets some great Tarantinian dialogue about the nuisance of “monologuing” villains), this film should be studied by any studio intent on bringing comic book icons to life. What makes these characters so compelling is how their powers seem to emerge organically from their personalities—the mother (Holly Hunter) literally holds her family together with her elastic arms, the young son (Spencer Fox) creates rebellious mischief with lighting speed, and the older daughter (Sarah Vowell) wishes she could disappear from the gaze of cute guys at school—and does. As for Mr. Incredible (Craig T. Nelson), his towering physique becomes a great source of humor after society has stigmatized the powers of super beings (much like what happens to Elsa in “Frozen”), forcing them to work menial jobs while suppressing their natural talents. His embittered line about American culture “finding new ways to celebrate mediocrity” is emblematic of what Pixar is a rebuke against. The layers of wit in Bird’s Oscar-worthy script are on par with the first three seasons of “Arrested Development,” and the director’s own vocal performance as super-suit designer Edna Mode (a tribute to legendary costume designer Edith Head) is an utter delight. Andrew Stanton’s “WALL-E.” Courtesy of Pixar. Andrew Stanton’s sci-fi opus is the most beautiful romance Pixar has ever conjured. Only the justly celebrated opening to Pete Docter’s “Up” (which works as a flawless short film and easily overshadows the uneven, sporadically enjoyable mess that follows) comes close to matching the power of its visual poetry. For nearly 40 minutes, the film is almost entirely free of dialogue, as the naturalistic “camerawork” (enhanced immeasurably by consultant Roger Deakins) focuses its lens on the plight of a plucky robot, WALL-E (voiced by revered sound designer Ben Burtt). He’s a machine tasked with cleaning up the rubble left by mankind, who have left Earth after rendering the planet’s environment uninhabitable. WALL-E spends his days dutifully compacting trash while pursued by his diminutive companion (a cockroach, what else? ), and relaxes at night by dancing to an old VHS of “Hello Dolly.” It’s clear from the get-go that this robot is a romantic, and when he spots a mysterious, seductive new machine in his midst (Elissa Knight), he can’t help falling for her. The silent comedy and heartrending poignance that is gleaned from this premise is simply masterful (there is a great deal of Chaplin’s Tramp in WALL-E’s misfit hero). Once the pair board a ship inhabited by humans, the film falters a bit, rupturing the purity of the wordless narrative. The live-action people glimpsed in early “archival” footage (including Fred Willard’s spot-on George W. Bush impersonation) make the blimp-sized humans in the second half all the more jarring, yet the “2001” homage where man must revolt against the technology it created is truly sublime. Lee Unkrich’s “Toy Story 3.” Courtesy of Pixar. As exciting as the prospect of a “Toy Story 4” (due out June 16th, 2017) may be, I have trouble imagining that it will come anywhere near topping the gloriously bittersweet sendoff that is Lee Unkrich’s “Toy Story 3,” the film that put the “Toy Story” franchise in a league with the greatest trilogies in cinema history. The script by Michael Arndt (of “Little Miss Sunshine” fame) is a magnificent achievement, perfectly blending laugh-out-gags and startling pathos while guiding the relationship between the now-college-bound Andy and his beloved toys to its inevitable conclusion. There are shades of Ramin Bahrani’s unmissiabe short film, “Plastic Bag,” in how the toys begin to question the meaning of their existence after escaping the wretched fate of a garbage dump. In desperation, they flee to a day-care center presided over by the deceptively welcoming Lotso Huggin’ Bear (Ned Beatty), a more sadistic variation on the equally fatherly Stinky Pete in “Toy Story 2.” The animators’ insistence on having the limbs of toys move as they normally would reaches new heights of hilarity upon the debut of a fashion-obsessed Ken doll (Michael Keaton) who naturally falls for Barbie (Jodi Benson, best known as Ariel in “The Little Mermaid”). Her line, “Authority should derive from the consent of the governed, not from the threat of force,” is one for the ages, as is the running gag where astronaut doll Buzz (Tim Allen) has his settings switched to Spanish mode, causing him to transform into a salsa-dancing, amorous conquistador. This is an enthralling ode to the twilight of childhood, and it culminates in the saddest happy ending in many a moon. 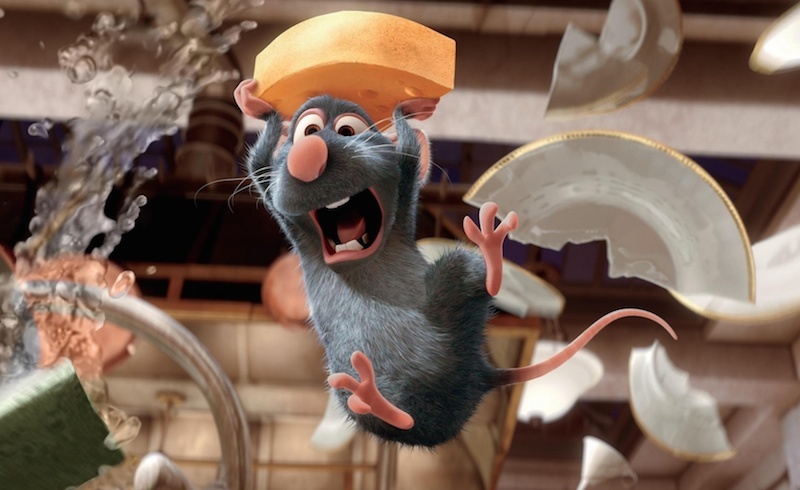 Brad Bird’s “Ratatouille.” Courtesy of Pixar. Continuing his obsession with characters who desire to reach their exceptional potential, despite being ordered by society to “shut up and eat their garbage,” Brad Bird serves a sumptuous cinematic dish so vibrant in flavor that its aftertaste will last for weeks on end. Patton Oswalt’s sardonic feistiness makes his voice a perfect fit for Remy, an effortlessly verbal vermin who loves the art of cooking and dreams of one day becoming a Parisian chef. He stumbles into an unconventional friendship with Linguini (Lou Romano, a vocal dead ringer for Jack McBrayer), the klutzy new employee at one of the most honored restaurants in Paris. When the film shifts its focus to the human world, Remy’s emotions are conveyed through pantomime, and never once is it unclear as to what he is thinking. Thanks to a blessedly unexplained flight of fancy, Remy discovers that he can control Linguini’s movements by tugging on his hair, reducing the man to a literal marionette. Inspired slapstick ensues, reminiscent of “All of Me,” while Linguini emerges as an endearing everyman akin to Jack Lemmon in “The Apartment” (after revealing that his mother has died, he reassures his cantankerous boss that, “She believed in Heaven, so she’s covered, after-life-wise.”). Most unforgettable is the chief villain, food critic Anton Ego (Peter O’Toole), whose greatest sin is that he has somehow convinced himself that his opinion is, in fact, the final word. When a taste of the titular entrée transports him back to the moment in childhood when he first fell in love with food, Bird reminds us of the transcendent impact that great art can achieve. Andrew Stanton’s “Finding Nemo.” Courtesy of Pixar. It makes sense that Lee Unkrich served as co-director on Andrew Stanton’s “Finding Nemo,” since his “Toy Story 3” shares the theme of “letting go.” One of the key exchanges in any Pixar movie occurs between clown fish Marlin (Albert Brooks, impeccably cast) and a Blue Tang with short-term memory loss, Dory (Ellen DeGeneres in a landmark voice-over performance). Marlin is beside himself that his only son, Nemo, has been snatched by scuba-divers. “I promised him that nothing would happen to him,” he wails to Dory, who pauses before replying, “Huh. That’s a funny thing to promise.” It’s clear from the shocking, seemingly post-9/11-inspired prologue that Marlin is suffering from post-traumatic stress after losing his wife and unborn children to a bloodthirsty barracuda. So intent is Marlin on not allowing danger to befall to his son that he has grown into an over-protective mass of neuroses. Brooks’s chemistry with DeGeneres is similar to what he achieved with Debbie Reynolds in his comedy classic, “Mother.” Dory may be infuriating at first, but her cockeyed perspective occasionally enables her to find a clarity of thought even in the murkiest corners of the ocean. There are many explosively funny gags—quite literally when an underwater blast results in an uproariously understated fart joke—and the detail of the underwater landscape is rapturous, yet what impresses above all is the astonishingly complex expressiveness of the characters. 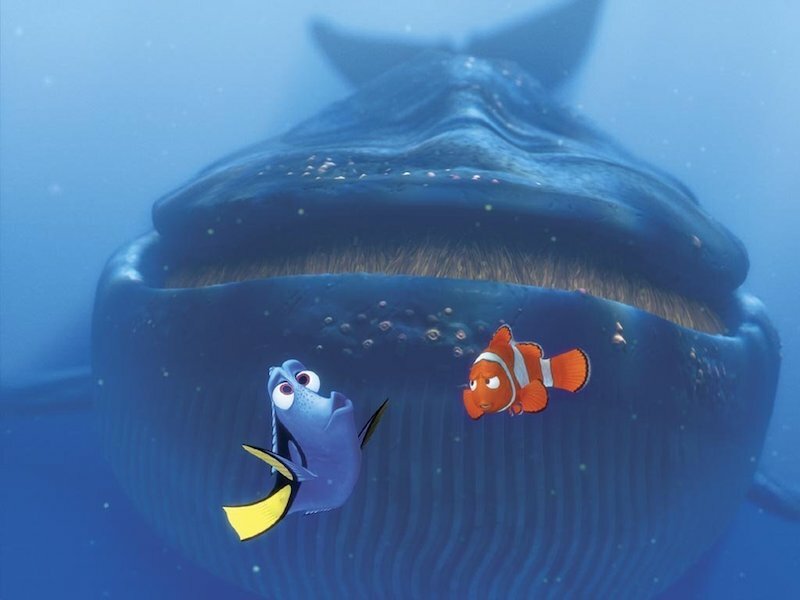 When Dory tells Marlin that she’s feels at “home” with him, the vulnerability registering on her face likely couldn’t be improved upon by even the most gifted actor in live action. It’s that good. Also, Hitchcock buffs will be pleased by the back-to-back satirical nods to “Psycho” and “The Birds” (it’s clear after this and “WALL-E” that Stanton is a classic movie nut. Paging Robert Osborne…). Toward the end of Lasseter’s groundbreaking triumph, there’s a cutaway gag to a family listening to “Hakuna Matata” in their car, a tip of the hat to Disney, which had just enjoyed the phenomenal success of “The Lion King” the previous year. “Toy Story” signaled not only the end of 2D animation in Hollywood, but also the end of the Disney Renaissance that began with 1989’s “The Little Mermaid.” Disney’s animation studio would languish in misguided projects for nearly two decades until 2013’s “Frozen” (which, like “Mermaid,” mined current Broadway tropes for inspiration, albeit with far less imagination) put it back on the map. 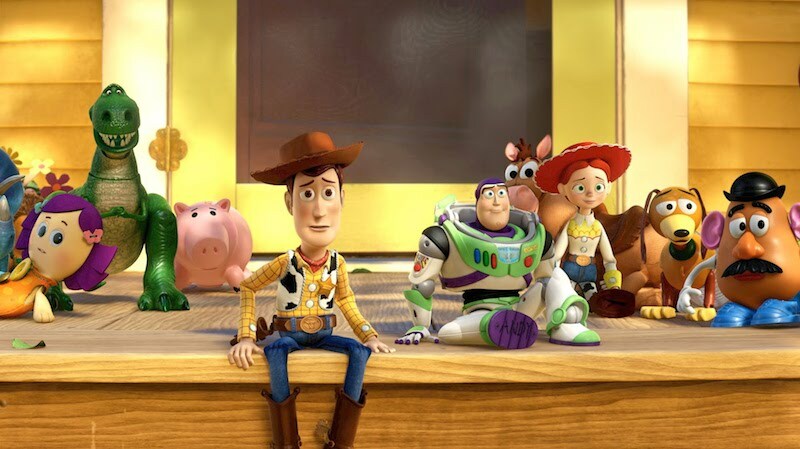 Clocking in around 77 minutes (not including end credits), “Toy Story” was clearly an experiment for all involved, and it ended up changing the industry forever. What many people tend to forget is how the script (co-authored by Joss Whedon), while offering a spin on the familiar buddy comedy formula, was every bit as inventive as the digital animation. It is one of the all-time great crowd-pleasing entertainments, chock-full of instantly quotable lines, breathtaking set-pieces and thoroughly lovable characters. Buzz Lightyear’s catchphrase, “To infinity and beyond,” set the tone for every subsequent Pixar feature, pointing toward the limitless potential of a new technology harnessed by unbridled creativity. 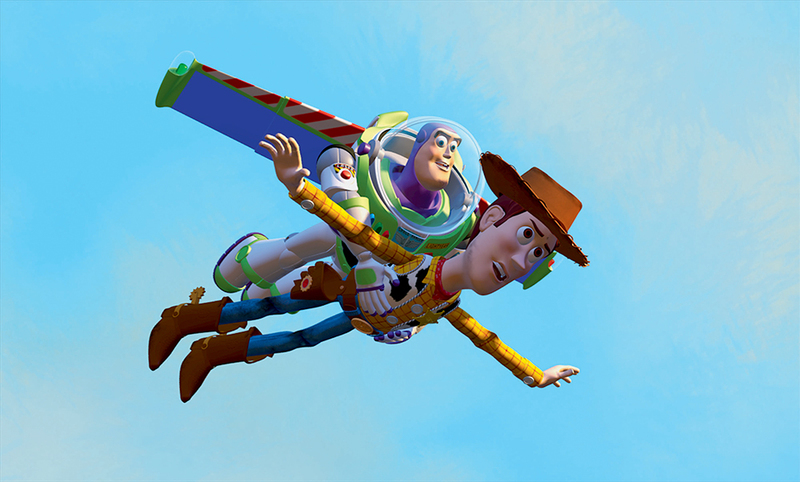 Buzz is the best role in the film career of sitcom star Tim Allen, whose endless riffs on clueless masculinity made him an ideal choice to play a toy who really thinks he’s a “space ranger.” The devastation he feels upon realizing that he’s indeed a “child’s plaything” is genuinely affecting, but that still doesn’t stop him from soaring into the heavens, just as Remy’s identity as a rat didn’t stop him from cooking up mouth-watering meals. I’ll never forget the rousing applause I heard on multiple occasions while watching “Toy Story” in the theater during its initial run. Watching the film now makes me feel quite a bit like the reformed Anton Ego. It takes me right back to childhood. 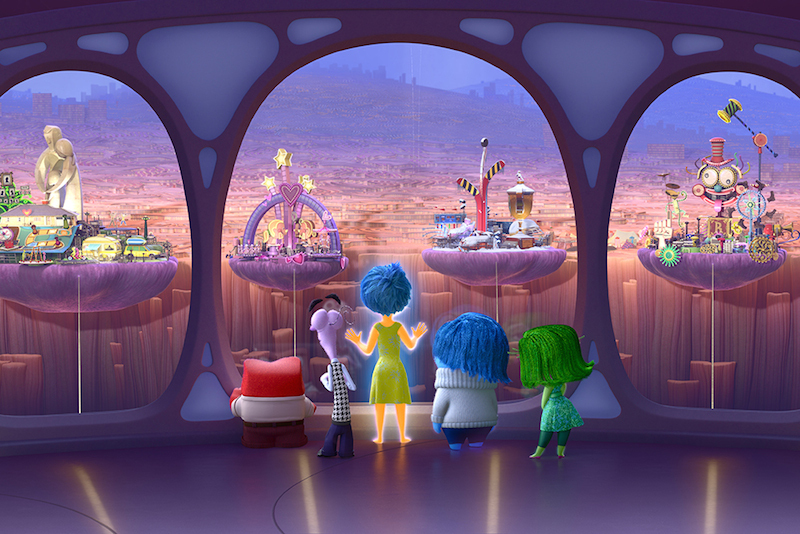 Pete Docter’s “Inside Out.” Courtesy of Pixar. Jim Henson once said that if you put all of the Muppets together, they would equal a complete human being, since each character embodies a particular aspect of the human psyche. Thus, it only fitting that two of the original Muppeteers, Dave Goelz and Frank Oz (previously featured as a Mel Cooley-like nebbish in “Monsters, Inc.”), have a blink-and-you’ll-miss-it reunion voicing guards of the subconscious in Pete Docter’s exhilarating masterpiece, “Inside Out.” It’s Pixar’s fifteenth feature in twenty years, and it serves as a jaw-dropping return to form after two underwhelming retreads (“Cars 2,” “Monsters University”) and one ill-advised venture into Disney territory (“Brave”). What the filmmakers have devised here is at once a revelatory coming-of-age tale and a staggering exploration of human psychology. Much of the film takes place within the mind of 11-year-old Riley (Kaitlyn Dias), whose content Midwestern life is upended when her family moves to San Francisco. Riley’s emotions take the form of characters—Joy (Amy Poehler), Sadness (Phyllis Smith), Fear (Bill Hader), Disgust (Mindy Kaling) and Anger (Lewis Black)—operating the control panel of her mind. Joy is used to taking center-stage, but starts losing control when Riley suddenly finds the happy memories of her former home turning melancholy, thanks to some instinctual tampering from Sadness. It’s not long before Joy and Sadness become stranded in the outskirts of Riley’s mind, leaving Fear, Disgust and Anger to make their best attempt at mimicking Joy. The script was co-authored by Docter, Josh Cooley and Meg LeFauve, but there are times you’d swear it was written by Charlie Kaufman: there’s a train of thought that “runs all over the place,” an abstraction room that renders characters one-dimensional, an Imagination Land that provides the setting for a priceless “Chinatown” gag, and best of all, Dream Productions—a studio lot where performers entertain the slumbering Riley by frantically recreating her memories with amateurish zeal. Joy is a tricky role to pull off, and could’ve easily descended into a hideous caricature not unlike Mr. B. Natural, but Poehler does a splendid job of illustrating how maintaining constant happiness is hard work—and frankly, impossible. At the heart of it all is one of the most mature and vital messages ever conveyed in a children’s film: that sadness is every bit as crucial as joy in one’s own personal growth. The recurring line, “What can happen?”, previously uttered in “The Incredibles,” might as well be the studio’s undying mantra for taking risks and embracing the unknown. On the heels of delivering their best film to date, the creative possibilities in Pixar’s future seem, in a word, infinite. “Inside Out” is currently in theaters.